Incredible Development Today: Amer Othman Adi Wins a Stay of Deportation--Now Sat., Jan. 6, is a Celebration in Youngstown! Come celebrate this incredible victory with Amer! Amer Othman Adi Granted a "Last Minute Reprieve"
We are extremely pleased to report that Amer WILL NOT be deported this week, as we had originally thought and announced yesterday. 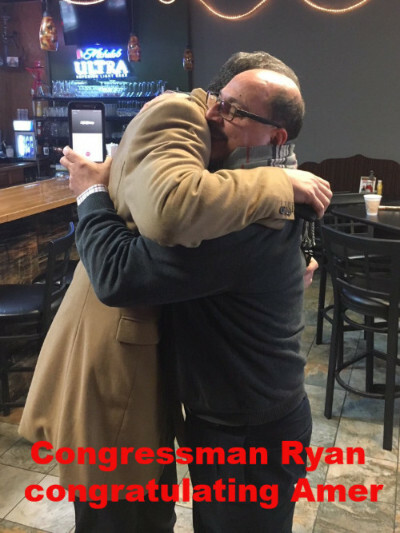 In an incredible turn of events, massive community pressure, and the important work of U.S. Representative Tim Ryan of Ohio, is allowing Amer to stay in the U.S. Yesterday's post from us also announced that there would be a farewell event in Youngstown this Saturday, January 6th. Well, that event will now be a CELEBRATION instead! Join Amer and his family, friends, and colleagues to mark this great victory! Support USPCN's work by making a tax-deductible donation to USPCN (c/o the WESPAC Foundation)! Copyright © 2018 USPCN, All rights reserved.